Do you know what a meniscus is? It's a disc of soft fibrous material that goes in between the two bones in the knee joint. Like everything in the body, it's there for a reason. The Lord put it there to absorb the shock between the bones when we bear weight on our legs. As long as the meniscus is strong, we can run, jump, ski, etc. without ever having to worry about traumatizing our knee joints. But what if it isn't there? What if your surgeon surgically removes it? There is a study that answers that very question. But before I get into the details of the study let me briefly explain why a doctor may want to remove a meniscus. Because of what it does, the meniscus is in a risky position. Make just the wrong kind of move and it can break in half. That can happen all too easily in various sports. And when it happens you know it right away. 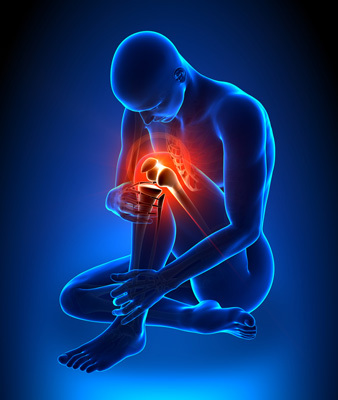 The knee becomes swollen, hurts, and is very painful if not impossible to move. And after the initial swelling and pain die down, the problems are not over. The knee joint often becomes locked in certain positions, making running, hiking, and even just walking very difficult. The most common therapy for a torn meniscus is surgery. The surgeon removes the broken fragment and the problem is solved. But is it really? And is there a better way to go than surgery? To find the answer to that question, doctors looked at 107 patients who had undergone surgery for a torn meniscus some 21 years prior to the study. They examined their knees and also took x-rays of the knees. The average age at the time of the examination was 55 years. Then they compared their findings to 68 men and women who were the same ages, but had never had any knee surgery. What they found should turn a few heads when it comes to meniscus surgery. The patients who were missing their menisci were 14 times more likely to have "advanced" degenerative arthritis of the knee than those who still had their meniscus intact. Not only that, but the surgical patients were much more likely to be complaining of knee pain and decreased function. This does not come as a big shock to me. As you may already know, I developed a treatment for degenerative joint arthritis of the knee called Prolozone. So I see a lot of patients who have bad knees. Most of them are older men who have been told that they need a knee replacement. And guess what? Most of them have had their meniscus removed earlier in their careers. So there is no doubt that surgically removing a meniscus is likely to create an arthritic knee years later. But what should you do if you tear yours? Here's my answer. If you are not in a hurry to start stressing it again, leave it in there. You can get it treated very successfully with a combination of Prolozone and Platelet Rich Plasma (PRP) therapy. Sure surgery is faster. It could take you three to four months to be back in shape with Prolozone and PRP, whereas you will be back to running in three to four weeks after surgery. But 20 years later, I'm betting you are going to wish you had been more patient. You can find out more about both Prolozone and PRP by going to my clinic website, www.antiagingmedicine.com. And you can find doctors who have been trained in Prolozone and PRP at the website of The American Academy of Ozonotherapy (www.aaot.us). REF: Roos H, Laurén M, Adalberth T, et al. Knee osteoarthritis after meniscectomy: prevalence of radiographic changes after twenty-one years, compared with matched controls. Arthritis Rheum. 1998 Apr;41(4):687-93.